One of the things I love most about inbound marketing is the ability to gather data and analyze metrics. In traditional marketing, results are lot more subjective. It is difficult to justify marketing costs when you cannot easily tie them to revenue…with solid data. Inbound marketing is much more measurable allowing marketers and leadership to analyze data in many ways. If you’re using a marketing automation platform, website conversion rates are just one of the metrics that are easily tracked. Last week, I wrote about website conversion rates and ways to improve them. One of the ways to improve your conversion rates is through A/B testing. In this post, I’ll provide more details. A/B testing is way to measure the effectiveness of one version of something, like a landing page or CTA, versus another. It is essentially an experiment where two versions of one piece of content are shown to two audiences (of basically the same size) to see which one produces better results. The first thing you need to do is figure out what you want to test. If you want to test a CTA, you can test the placement on the page, the color or even the text used. If you decide to test a landing page, you can test the text on the page, the form or the graphics. It is easiest to test one thing at a time. For example, if you’re testing a CTA, change one thing like the color. After that test is complete, test the placement on the page. If you try to test everything at once, it will be difficult to know which change had the biggest impact. Part of the planning includes knowing what results you’re looking for. For example, if you’re testing a CTA, are you measuring simply the number of clicks or the number of visitors who click it more than once? Be very clear. Additionally, document the baseline performance or how the current version is performing. The test must be run simultaneously. Timing can affect your results and you will not get another chance to recreate them. Once you decide what to test, the next step is to develop the content. Make the changes you identified when planning. When you’re satisfied with the content, set up the test in your marketing automation software. At Imagine, we use HubSpot. If you’re also a HubSpot user, these instructions will help you create the test. Once the test has been created, promote it! In order to know which version is the most effective, people need to see it. If you’re testing an email, send it to a big enough list. If it’s a landing page, use social media to promote the offer. As I’ve learned more about A/B testing, I have also learned more about achieving results that are statistically significant. In very general terms, if the results are statistically significant, it means that they did not occur by chance. When you set up your test, you may decide to run it for 5 days or send the email your testing to 500 people. And that’s a good place to start. If you want to measure statistical significance, there are many calculators available. Here’s HubSpot’s. For a full explanation of statistical significance, read this post from Measuring U. Once you have the results of your test, start planning another one. Just because the option you tested showed better results, it doesn’t mean it is the best option. Try changing something else and run the test again. Even good results can get better. 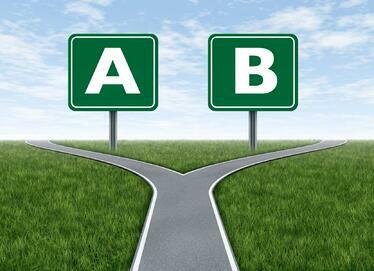 A/B testing is a critical part of inbound marketing. The ability to present solid marketing data to your team and organization is something that marketing teams have not always had. Take advantage of it!